Richmond, Virginia, July 5, 2016: The Patterson Avenue Baptist Church of Richmond, Virginia, recently voted to disband. The church’s final worship gathering will take place on August 20, 2017. The congregation’s property, located at the 4300 block of Patterson Avenue, will be donated to Movement Church, a recent church start, which currently meets in rental space at 3015 Cutshaw Avenue in Richmond. 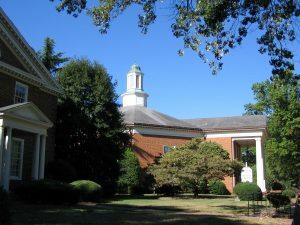 Patterson Avenue Baptist was established as the merger of two historic Richmond congregations. On October 1, 1989, the Park View Baptist Church (circa 1891) and the Calvary Baptist Church (circa 1877) merged to form a new church. The name Patterson Avenue Baptist was chosen to represent both its location and a fresh start for the unified congregation. Patterson Avenue Baptist had a very successful run supporting missions, engaging its community, and conducting ministry.Â The last several years, however, have been difficult, having mourned the death of nearly 75% of it resident members. Discussions about the church’s viability began in earnest in mid-2015.Â Many options were explored, including re-launching, relocating, merger with another church, and renting space within the building to other organizations, yet none seemed to satisfy the congregation’s need for the maintenance and upkeep of the facility. The congregation discerned two possible paths forward. Â First, it could sell its property, using the proceeds to establish an endowment to support mission causes in perpetuity. Second, they could entrust the church property into the hands of another congregation which could continue to use its facility as a place of worship and ministry. After several months of discussion and discerning prayer, the church met on June 9th for a vote. The consensus was overwhelmingly in support of donating the facility to Movement Church. Cliff Jordan, pastor of Movement Church, met with Patterson Avenue Baptist leadership on several occasions and with the congregation during a town hall gathering to explain Movement Church’s vision and purpose. “Pastor Cliff’s vision immediately connected and resonated with the majority of people in the Patterson Avenue congregation,’ Nieporte said. Members of Patterson Avenue Baptist will be welcomed to join Movement Church. Additionally, Movement Church will continue to support several long-term ministry projects and partnerships important to the congregation including an AA group that meets in the facility, the New Life International Korean Baptist Church, The Heartwood Grove School, and a long term ministry to residents of The Virginia Home. To arrange interviews, contact Dr. Bill Nieporte, Pastor of Patterson Avenue Baptist, 804-972-2745; and Dr.Â Cliff Jordan, Pastor of Movement Church, at 804-432-9464. Patterson Avenue Baptist, a historic Richmond congregation with more than 100 years of ministry in the region, will conduct its final worship gathering on August 20, 2017. It’s property will be donated to Movement Church, a new and younger congregation.